This screenshot could significantly bring truth to the rumours of LG launching the G3 soon. 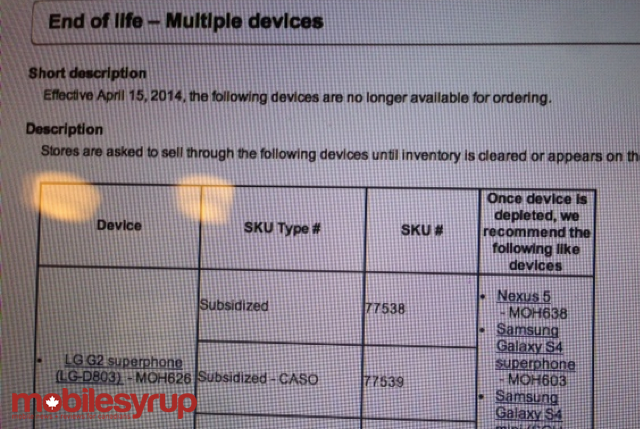 According to this internal doc, courtesy of Bell, the current LG G2 flagship has been placed on the “End of Life” list. This usually means that the current stock is being depleted and “no longer available for ordering.” Bell is requesting staff shift prospective buyers towards the Nexus 5, Samsung Galaxy S4 or for some reason the Galaxy S4 mini. The Verge recently reported that stated the LG G3 is slated to be available sometime this summer and will sport an impressive 2560 x 1440 screen resolution.